Geno Vento took fundraising to the next level! 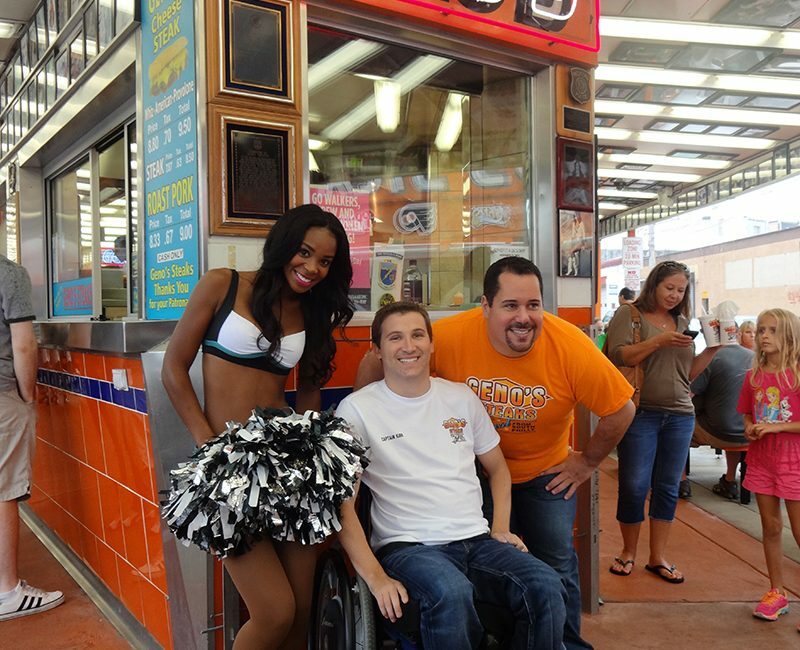 On Saturday afternoon, September 13th, Geno’s Steaks hosted a fundraiser for Kirk Crandall, a 23-year old man who suffers from neck-down paralysis following a car crash in 2012. Geno told Kirk that a portion of the day’s sales would go to funding Kirk’s upcoming rehabilitation program, but at the conclusion of the event, Geno surprised Kirk and his family with a check for $53,107 – the total amount needed for an entire year of treatment! Kirk was 21-years-old when he was involved in a major car accident near his home in upstate New York. The wreck left him with a complete C6 spinal cord injury, and he is now a quadriplegic (completely paralyzed from the neck down). Kirk and his mother, Shawn, have traveled the country seeking the best treatment for his injury, and became close friends with Geno when they met at Magee Rehab (where Geno rehabbed after a knee replacement). Insurance will no longer pay for Kirk’s treatments – despite the incredible strides he’s making on his own. Against all odds, Kirk has begun moving his arms and legs. A year with Mike Barwis is the most intensive treatment he can receive; Barwis has been known to perform miracles for professional athletes and those recovering from injuries. Geno knew Kirk couldn’t afford the life-changing treatment on his own. The event included music from DJ Perry Angelozzi and appearances from special guests like the Philadelphia Eagles cheerleaders. The best Philly cheesesteaks and happy tears were enjoyed by all!